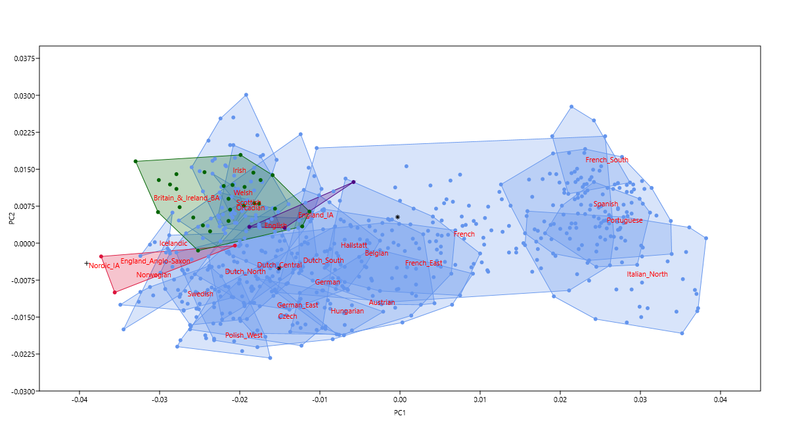 I don't know if anyone has tried this before but I separated into regions the British Neolithic and EBA (up to 1500 BC; includes all Beakers) references in the G25 data set. I got a 90-10 EBA-Neolithic split, which is interesting given the 90% population replacement concept. England_CA_EBA:I2462 is an outlier as can be seen on the PCA, perhaps of EBA and Neolithic ancestry? That looks interesting. If you wouldn’t mind, could you run one of those for me? This is a general comment, not directly to you JMcB. I've played around for the past few weeks with the ancient British G25 data and I find the modern British population to be almost identical to the MBA/LBA/Iron Age/Roman British population, meaning there was a southern shift from the initial British Beaker population to the British MBA population of 0-15%. Why couldn't this have been the Beaker population mixing with the British Neolithic population over the period of 2500-1500 BC, after all Neolithic sites like Stonehenge continued to be developed post-Beaker arrival and wouldn't it make sense that this was done by the British Neolithic population plus the Beaker newcomers? The last known construction at Stonehenge was 1600 BC, after which comes the British MBA and the apparently 'fully integrated' Beaker-Neolithic population that roughly persists to the present. I've just watched a 2018 BBC archaeology show with Alice Roberts where the latest figures extrapolated from the POBI study for Anglo-Saxon influence in the English population is 10%, down from the 30-40% figure that was claimed earlier. This fits with the modern PCA which looks like the Beaker population has shifted more towards Neolithic Britain rather than modern Germany/Scandinavia. My previous Iron Age model was a bit of a mess by the way - too much mixing of time periods, which I only realised by going through each sample on the Ancient DNA map. Nordic_IA (427-611 AD) is not in line with other Iron Age samples, for example. I'm now retired from model making as I think I understand British ancestry well enough that I don't have any outstanding questions to solve. I now doubt a Roman influence as the southern shift seems to have been in the British population from the MBA onwards and there has always been variation. You are at the high-end of British Neolithic influence, as expected from previous models. The three S_England regions on the map have been combined into one in the model. Thank you Capitalis, it’s greatly appreciated! As are your well considered thoughts. Not to mention the links you’ve provided! I’m going to be watching Alice Roberts shortly. It’ll be interesting to see what Reich’s new study reveals along these lines because, if I remember correctly, he has mentioned the possibility of a later remixing event with at least pockets of the Neolithic population. Thanks for the thread, its super interesting stuff. Just makes me salivate more for Cassidy's thesis on Irish origins, and others. Its implied in her excerpt that pockets of Neolithic people survived in EBA Ireland, and that different groups of Beaker had different levels of steppe ancestry. Im not sure of she means Rhenish vs Armorican. Davidski also recently posted that there were large continental contributions to Britain from Hallstat, though that doesnt seem indisputable. This varies by Beaker individual (as you noted via Ms. Cassidy) and I could produce a nice bar chart but the variation in Britain can be seen in each time period in my chart above. Again, this varies by individual, with some being closer to the Beaker_Britain ratio. English have higher Globular_Amphora than Irish, in general. If you plot Globular_Amphora on a PCA it lies in almost exactly the same spot as England_N and Scotland_N, so post-Beaker arrival in Britain we are likely seeing a rise in Britain_N. All periods of British samples from Beaker to Modern lie on a straight line between Yamnaya_Samara and Globular_Amphora/Britain_N. I've thrown all sorts of samples into the model from ancient Southern Europe, Northern Europe, Near East, etc. and none of them are really favoured over the simple two-way model so in general I think it's possible that there's no need for anything more complex than this. - in this PCA sensitive to recent drift, take a look how England_IA cluster relative to Britain_&_Ireland_BA. And especially note the unusual position of one of the England_IA samples. This doesn't look like a bounce back in local Neolithic ancestry, because it's way too late (Iron Age), but rather like a new population coming in, probably from what is now France (Hallstatt? Belgae?). Last edited by Generalissimo; 09-30-2018 at 07:04 PM.